Many attorneys in Texas offer their services on various fee options to assist low- and middle-income Texans who need help with legal issues. Use our attorney search directory to find lawyers who offer their services using various fee options. Click on the button above to go to our Find a Lawyer search page and begin answering the questions by clicking on the arrow in each drop-down box. Be sure to scroll down to “Fee Options Offered”—click on the orange question mark to find out what the different fees mean—and check the appropriate box. Once you have finished, click on the “Submit” button at the bottom of the page to start your search and then wait for the generated list of attorneys. 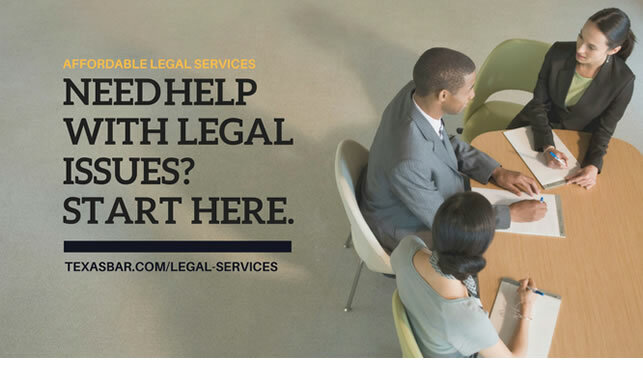 The Lawyer Referral & Information Service, which serves more than 246 counties in Texas, helps people who are in need of legal assistance find a lawyer or other resources. Many programs, nonprofit law firms, and referral services are available to help middle-income Texans with legal needs. Texas Legal is a nonprofit legal benefit plan established by the State Bar of Texas and the Texas Legislature to help Texans with their needs. These organizations and programs offer services for those in need of legal assistance who cannot afford it. For low-income Texans, this directory is a listing of low-cost civil legal aid providers by county. Legal Aid of NorthWest Texas is a Fort Worth-based nonprofit that offers free civil legal assistance to low-income Texans in 114 counties in north and northwest Texas. Lone Star Legal Aid is a nonprofit free legal aid provider that serves 72 counties in the eastern and Gulf Coast areas of Texas. Texas RioGrande Legal Aid is a nonprofit that provides free legal aid to low-income residents in 68 counties in southwest Texas. Texas Lawyers for Texas Veterans is a State Bar of Texas program that hosts legal advice clinics throughout the state to help low-income military veterans and their families with legal issues. Self-help resources are available to Texans in need of legal services. 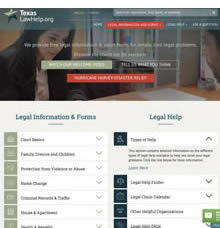 TexasLawHelp.org provides Texans with free information, self-help legal forms, and a live chat feature for low-income Texans.